*Selective contrast enhancing filter, especially suitable for reflector telescopes and true Apochromats. Also effective on smaller economy telescopes that cannot benefit from expensive narrow-band nebula filters due to the huge light-loss involved. *Transmits a maximum of light, while blocking unwanted skyglow and many street light emissions. *Unique selective blocking feature of the NEODYMIUM element greatly reduces glare, without reducing recognition of important colour and brightness variations. *Transmission within the selected wave bands exceeds 95%. *Planeoptically polished! Retains full image resolution – even at highest magnification, way above 200x, or during eyepiece projection work – even in front of a binocular viewer. *Ultrahard and durable Ion-beam hardened coatings, may be cleaned any-time without fear. *No image degradation as with 'flame polished' filters. 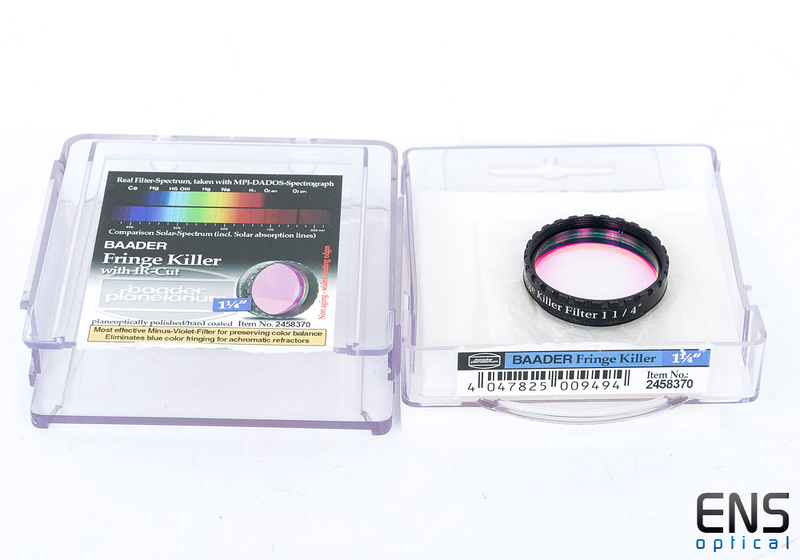 *Non-vignetting filter cells, larger in aperture than any competing design, featuring a CNC milled 'crown' for ease of handling and attachment.